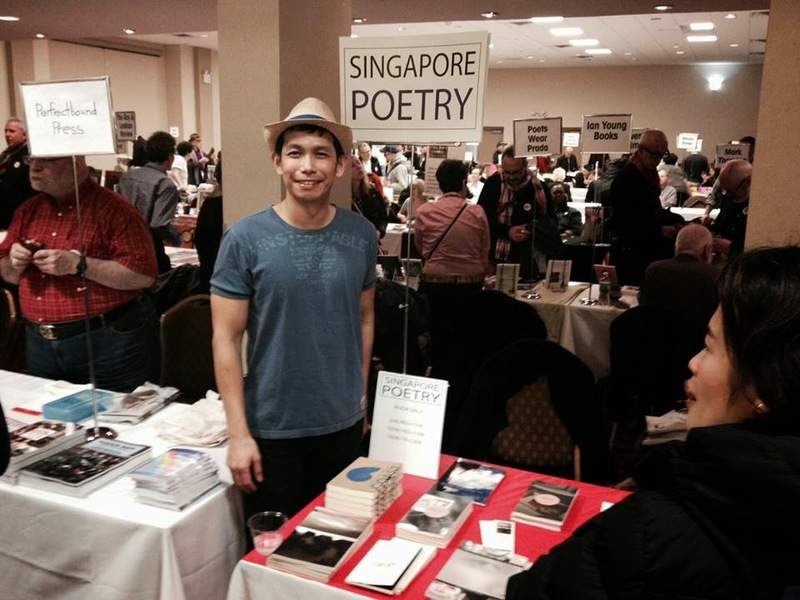 It was a very successful outing for Singapore Poetry at the Rainbow Book Fair yesterday. Sold lots of books and talked to lots of interesting people who stopped by the table. Michael Broder, representing A Midsummer's Night Press, was at the next table. Roxanne Hoffman and her Poets Wear Prada Press was just behind me. Paul Rozario, who was kind enough to help man the table for part of the day, discovered a talent for selling books by chatting people up! We gave out the bookmarks promoting the Singapore Literature Festival in New York in October. I enjoyed reading at the Poetry Salon organized by Nathaniel Siegel. Alex Goh and Christine Chia came for the reading; Sarah Sarai and Charlie Bondhus stayed after theirs. Bryan Borland and Matthew Hittinger came by the table. The only regret was that I was so busy that I could not find the time to look around the fair and say hello to friends. Really liked Paolo Sorrentino's film "The Great Beauty" ("La grande bellezza") for its leisurely beauty and heartfelt melancholy. Toni Servillo was superb as Jep Gambardella, who launched himself into Rome's elite circles on the wings of a brilliant first novel, sustained his altitude on seductive charm and cutting wit, but could not write another novel because he did not find the great beauty, even after years and years of half-hearted searching. Bringing in the Saint at the end, a nun who had devoted her life to serving the poor in Africa, did not feel cheesy, but provided proper foil to a wasted life. Yet who can say the life is wasted? For if beauty comes in fragile flashes, all we can do is to catch it while we can. The soundtrack was magnificent. After reading Malcolm Cowley's first collection of verse, Blue Juniata (1929), Conrad Aiken asked: "What do you think or feel which is secretly you? Shamefully you? Intoxicatingly you? Drunkenly or soberly or lyrically you?" In the poems, to Aiken's eye, "this doesn't come out", their creator having "avoided the final business of self-betrayal". * "[Malcolm Cowley:] It's really easier to give your life to a cause than to hold out for a particular sentence that embodies your way of looking at life -- yet if you surrender on the wording of a sentence, and another sentence, pretty soon you find yourself living for the opposite cause to the one you had intended to die for." As a description of "self-betrayals" possible in style alone, this can hardly be bettered. Death is not the opposite of life but a part of it. This is what Toru Watanabe, the protagonist of the novel, learns from the suicide of his best friend Kizuki at the age of seventeen. Toru and Kizuki's girlfriend Naoko, joined by this incommunicable sadness, struggle in their different ways to live with the knowledge of death. The novel is a tender depiction of this struggle, its momentary successes, its relapses, its endurance. Naoko finally puts herself in a progressive mental health farm, Ami Hostel, in the hope of getting better. On a long bus ride to visit her, Toru passes through interminable cedar woods, broken only by small rural villages. The landscape of that bus ride becomes, very quietly, a metaphor for living with death. Debbie Chou invited me to a concert at Steinway Hall last night. The ornate building was put up in 1926, white marble from Italy, green marble from Greece. I was glad to see it before the company's move at the end of the year. The performers were the Albek Duo, twin sisters from Switzerland. Ambra Albek played the violin and viola, Fiona Albek the piano. They opened the program with pieces by American composer William Perry, who was present in the audience. I enjoyed very much their performance of Edvard Grieg's Sonata No. 3 in C minor, Opus 45, (1886). Their musicianship shone through. They were lovely in person too, when we talked a little during the reception afterwards. Wrote another haiku this morning. Not related to the concert last night. I've been ploughing through the Norton Anthology of Postmodern American Poetry, more out of a sense of obligation than anything. I am surprised, however, by the amount of pleasure I received. Sure, there were many things that I would not care to read again, but the poets that I would sue to know better were not a few.